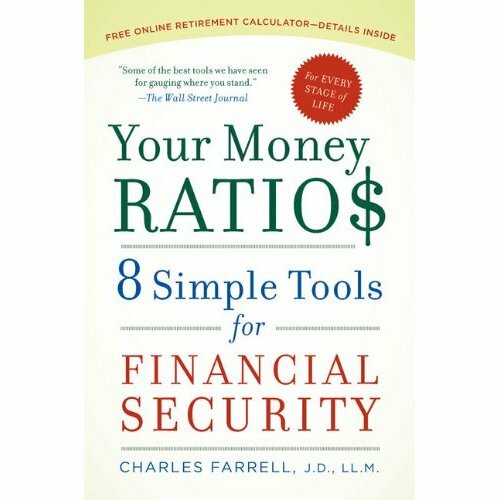 I recently read Your Money Ratios: 8 Simple Tools for Financial Security by Charles Farrell. I’ll be honest, these days I read everything with an air of skepticism and although it took me several pages to get engaged I could tell I had found someone on my wave length. First a bit about Charles: He’s an investment advisor in Denver, Colorado. He also writes the “Retirement Roadmap” for the CBS Moneywatch site. Previous to his work as an investment advisor he was a tax attorney. So the man knows his business. Essentially “Your Money Ratios” covers most aspects of the personal finance world delving into saving, social security, debt, investing, stocks and bonds, insurance and how to get help. The novel approach is applying a set of relatively simple ratios to determine how much and of what type of the various components you need. Not to give away all of the ratios but for example with regards to Mortgage debt he lists some ratios of income as compared to the size of a mortgage you should have on your home. So let’s take a theoretical example using your yearly income which is $100,000 just for ease of calculation. If you are 33 taking your income of $100,000 yearly multiplied by your Mortgage to Income Ratio of 2.0 you should not have more than $200,000 wrapped up in your mortgage. A year or two ago that would be laughable and would have been derided for being too conservative but based on our recent corrections that makes good sound sense. The book goes on to provide 8 simple ratios for determining Retirement Savings requirements, mortgage debt, education debt, investment distributions, disability insurance requirements, life insurance requirements and long term care ratios. It’s a relatively simple way to check how you are doing in the key components of your financial life. Your Money Ratios is targeted squarely at the beginner to intermediate reader looking to get a handle on their fiscal fitness. There’s enough information to get you going and give you some direction with most aspects of your financial life. His recommendations are sound. He doesn’t naturally assume that social security is going to disappear tomorrow and includes that in retirement planning which is a nice change of pace. It’s straight math designed to get you to a place where you can retire and live comfortably. If you would classify yourself beyond a beginner in personal finance most of this information is not going to be new to you. Further if you are looking for some motivation beyond basic arithmetic to get you headed in the right direction this is not the book you’re looking for. There are no inspirational stories of people who’ve used these ratios to meet their financial goals. No tales of near bankrupt couples paying off all of their debt to live a life they’ve only dreamed of. No this is straight up solid advice without much frill and can be a bit dry at times. But face it personal finance is a little dry. Honestly I really enjoyed reviewing Your Money Ratios. His advice is good and guides you around the idea of being a capitalist or a laborer. Essentially getting your money working for you or spending all of your time working for your money. For instance does taking out $250,000 in student loans help you to transition from a laborer to a capitalist? No not if you are going to be making $35,000 a year for the next ten years. It’s very simple but it works. His detailed section on retirement planning also got me to thinking about my own retirement goals. It’s challenged my notion of what balance of stocks and bonds makes sense in my portfolio. If you are looking at a good starter that covers the spectrum of personal finance this is a great book. Congrats to Ken who’s comment was chosen using Random.org, Ken look for my email. Since I’m 23 years from retirement I’m sticking with 75% stocks and 25% Bonds. While the market has tanked this past 2 years I think stocks LONG TERM are still a good choice. I think I have a problem. I’m addicted to finance and business books, so how could I not at least enter. For my retirement planning my biggest goal is to diversify not just between stocks and bonds but more so in the types of investments. I look to have hard assets, strategic investments, retirement assets and cash value life insurance. Right now that includes maximizing cash value life insurance, balancing my retirement assets (between Roth and Traditional) and looking to expand real estate as well as company investments. .-= Evolution Of Wealth´s last blog ..Sunday Link Rodeo 15 =-. Our nest egg will be smaller than most–we’ll be working through our lives to create passive income streams, and we’re never planning on truly “retiring.” But we’re still looking to save a substantial amount as a safety net, mostly for health care expenses. .-= Wojciech Kulicki´s last blog ..Looking Out to 2010: Economy and Personal Finance =-. I would like to retire early (as in not having to care about how much I am paid – I will still be willing to work, but I want to do something I enjoy). I am planning on using my 401K for 60+ and right now I have 91% of that in stocks. It seems like a lot, but I am not 30 yet so I still have time. I re-allocate each year. The rest of the retirement income (age 50-60) will come from my other accounts, which right now are about 70% stocks. .-= Little People Wealth´s last blog ..December Extra Earnings and Budget Update =-. The accountant in me is touched by this review! I like the conservative ratio on mortgages, makes a lot of sense. Most industry “experts” will have you taking three, four, five times annual income for a mortgage, which is (and always was) an act of being voluntarily house poor. Was the book written before, during or after the housing collapse??? .-= [email protected]´s last blog ..7 Ways to Improve the Success of Your New Business =-. Relatively sure it was in the middle of it. There are many references to the economic hardships of 2008-2009. Hi Paul, great review! I’m so pleased you enjoyed the book. Thanks so much for all the time spent reading and reviewing Your Money Ratios.. it is very much appreciated! .-= Lisa´s last blog ..TLC Book Tours TOUR STOPS for the week of January 4th ““ 8th =-. .-= Financial Samurai´s last blog ..Potential Best Seller Review & Giveaway: “Your Money Ratios” =-. Forgive me but are you not also giving away a copy 🙂 Besides I saw that you won a Flip Camera the other day. I assure you it will be completely random based off of random.org. I agree about reading this when I was 21, although I’m not sure I would have made it through. You’re welcome to enter in my giveaway too. I’m looking at about 10 years to retire so my focus is first to pay off all non-mortgage debt and then sock away as much as possible for retirement. We do already have a good start on retirement funds, but need another $150,000 for me to feel comfortable. Our mortgage is much less than the ratio for my age so we’re donig okay. My 401K mix is becoming more conservative now. .-= Bucksome´s last blog ..5 Ways to Make Over Your Leftovers =-. Nice solid plan, did you have a more aggressive mix in the past for your retirement? How do you feel about the 50/50 ratio proposed by the book? I’ve got a solid government pension, so ratios that only focus on individual savings (IRA/401K/RRSP) don’t really apply to me. We should have all my debt (including mortgage!) paid by the time my wife and I are 35, at which time we’ll increase the pace of our retirement savings. I’m guessing the nest egg will hit around $400k by the time we retire, but that’s not including our pensions which should cover any basic needs. Thanks for the giveaway – I’d love to have a read through this one!